They Kill Cats, Don't They? After WWII, in a great rush of patriotic pride and zeal, thousands of towns and cities across the US accepted our government's offer of an icon of the war. These were usually in the form of a howitzer, a tank, an ack ack gun, or some other deadly artifact that would lend itself to a civic display and help create a memorial to the men who had fought and died in the war. The War Department was bulging with leftover and obsolete articles of war and they were frankly running out of places to store them. Having every town in the country take something off their hands was a perfect solution to the problem and I'm sure Washington was only too glad to have someone else take responsibility for their growing pile of stuff. To lesser extent this was also done after the First War, and on the court house lawn in my boyhood trading center town of Philippi, is still displayed a German machine gun, under the statue of 'Iron Mike' and a bronze tablet with the names of the men from our county who gave their lives in that war. I'm pretty sure though some thirty years later, that the commissioners who chose a memorial to the second war wished in retrospect that they had gone for something as compact as a machine gun. As it turned out, they got an airplane. 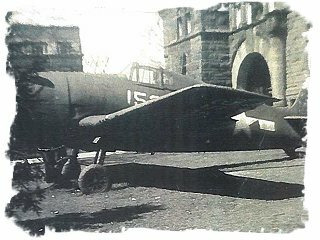 It arrived at Benedum Airport in nearby Bridgeport during the summer of 1947. 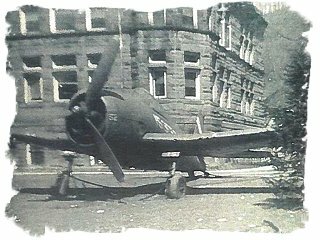 It was a nearly perfect Grumman F6F Hellcat fighter, flown in by the Department of the Navy and presented to the town. One of the coal operators in town owned a low boy trailer and tractor, so the wings were folded and it was loaded on the trailer and trucked the twenty miles to Philippi. Once there it was installed on the lawn in front of the court house. I imagine the county officials who choose this item for their display had seen a picture of the airplane in the listing of available war leftovers from the DOD, but until it was setting in place, its bulk looming over the grass that was slowing dying from the steady drip of oil from the huge radial, no one realized how BIG the damn thing was. They positioned it on the right side of the square, as far back as it was possible, but its presence pretty much made that side of the lawn unusable for anything else. The county fair came each fall and situated on the grounds around the court house and the airplane was right where several booths had always been placed. The maintenance man complained about the dying lawn and about the trimming he had to do around the airplane, and several other folks complained about it being an eyesore. Our monument wasn't really working out. On the other hand, my seven year-old self thought I had died and gone to heaven. After a lifetime (time being relative here) of airplane famine, at last here was an actual airplane I that I could walk up to and touch anytime I could cage a trip to town with my dad. It seemed surreal. Our home was in the tiny hamlet of Arden, some nine miles down the river from Philippi. I had had a lifelong love affair with aviation that had remained achingly unconsummated while I watched the sky from our home on the banks of the Tygart River. No one else in my family had even a passing interest in airplanes, so I had received my passion for things aeronautical mysteriously, apparently from a misalignment of genes at birth. To this point I had sustained it only with handed down flying magazines and by watching the J-3's and Taylorcraft from the Philippi Airport, as GI Bill students buzzed their parent's homes in Arden. Without a family car, catching a ride to town with a neighbor was pretty much the limit of our family's travel, so my options were limited in getting to places where there were airplanes to see close up. Now, here was not only an airplane that I could touch, but a beautiful Grumman fighter that I had read about in flying magazines. I knew all of its specifications, its speed and its fighting history. I couldn't get enough of the Hellcat during our infrequent visits to Philippi. However, being Southern and in the middle of being 'Raised Right', I wasn't allowed to say 'Hell', so I referred to it only as 'the airplane' when talking about it to mom and dad. They knew which airplane I meant. It's embarrassing to admit, even all these years later, but the airplane costarred with me in full color movies that ran in my head at night. I would put myself to sleep with these productions, wherein I was flying the Hellcat, usually with Sue Proudfoot, my unrequited grade school first love, looking on admiringly as I did the run up. Actually, the whole school would be there, cast as admiring onlookers, standing respectfully back, but Sue would stand on the wing and bid me goodbye and tell me to fly carefully because she, you know, cared about me. I logged many hours in the Grumman in these nighttime daydreams I flew it from the plateau on the mountain above our house, where years later I actually did land an airplane. It wasn't a Hellcat though. I can't remember exactly how long it was until the grumbling about the Grumman reached the point that the county officials decided to do something about it, but one day when I got to town it was just gone, its place marked only by dead grass and oil residue. I learned that Wilbur Simpson, the operator of the local airport had received a call from the county and was told that he could have the airplane if he'd just come and get the blamed thing out of their way. He towed it behind his jeep the five miles to his little grass airport and there it remained for the final chapter of its life. Years later when I was a pilot, I became friends with Wilbur and got to know him well. When I asked him one day about the Grumman, he sheepishly confessed that he had called a scrap dealer and had it cut up where it sat. By this time the remaining WWII aircraft had started to become valuable and he realized how foolish he had been. He also said that when he picked it up from the court house, the battery was still charged and that he believed he could have flown it. I still think about the big Navy Blue airplane that once stood so tall and proud in the middle of our town. I know that it was only one, among the tens of thousands of airplanes that helped win that long ago war, and that suffered a similar ignominious end. But I had stood beside this particular airplane and touched it with my child's hands, and it had touched my young soul at a very impressionable time in my life. In a way, I think I still grieve for it.